In this week's Reader Kevin Warwick sounds pretty thrilled about the St. Vincent concert at Metro on Wednesday evening. 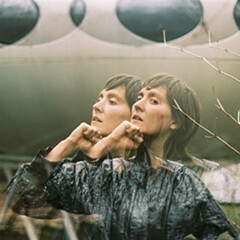 But I'd like to share some enthusiasm for the opening act, Welsh singer Cate Le Bon—I find her a lot more interesting, and naturally she's been thoroughly overshadowed by the headliner. Last year, when I first heard Le Bon's debut album, Me Oh My (Control Group/Irony Bored), I found it quite pleasant, but after some additional spins over the past few days I realize I didn't give it enough credit. It's a beguiling, wide-ranging piece of work that portends great things from Le Bon. At the center of the album is Le Bon's beautiful voice, an instrument of crystal clarity that sounds made for classic British folk—I can hear greats like Sandy Denny as well as superb contemporary LA singer Mia Doi Todd. She was discovered a few years ago by Gruff Rhys of Super Furry Animals—Irony Bored is his indie label—and the musicians on Me Oh My include members of brilliant Welsh band Gorky's Zygotic Mynci. Le Bon's songs ramble all over the place, yet still sound of a piece—they glisten with strong pop hooks, and the arrangements are flush with psych-rock flourishes. There are some retro-futuristic traces of the BBC Radiophonic Workshop on the title track, and the pleasantly rambling "Sad Sad Feet" sounds like a strummy Velvet Underground oddity, with what could be a guitar lick from Pavement's "Range Life." On "Hollow Trees House Hounds" there are some nicely acidic 60s punk guitar lines (check out the video below). Throughout the album the melodies are lovely and insinuating, burrowing deep into your brain, and the instrumental backing keeps you guessing even after the fifth listen. Below the video you can hear "Puts Me to Work," the first single from Le Bon's forthcoming second album, CYRK, due from the Control Group early in 2012.